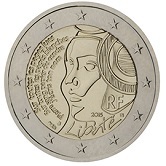 The year 2015 will again provide a new record in the number of commemorative coins planned. 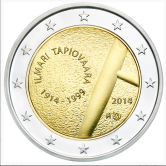 There will be 28 specific country commemorarives and a joint issue consisting of 19 coins.This will be the forth and to date largest of the joint issues.The occasion for this joint issue is the 30th anniversary of the establishment of the Euro flag. 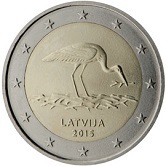 Lithuania entered the euro zone and also issued its first commemorative -the only country to issue a commemorative in the first year of its being in the Euro Zone. Another issue much celebrated was 25 years of German unification. 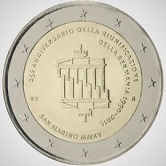 Both Germany and San Marino issued two euro commemorative coins to celebrate this event. 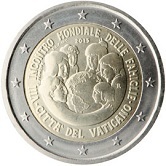 In case there is any confusion as to why the Vatican issued a similar coin in 2014 - their coin celebrated the fall of the Berlin wall which occured towards the end of 1989, the unification then followed in 1990. 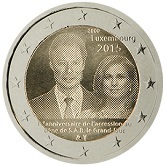 Luxembourg issued two coins and some interest attaches to both of them: the first issue celebrating the 25th anniversary of the accession to the throne of the Grand Duke is with a new printing procedure that supposedly gives true to life images.The second again relates to printing issues and concerns the Luxembourg version of the joint issue. 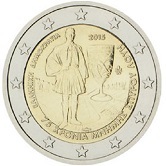 Here viewing the coin from one angle shows the EU flag and from another angle the head of the Grand Duke. Here are two images of the joint issue - apart from the Luxembourg issue, all the others differ only in the name of the issuing country. 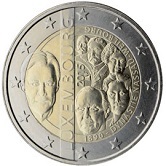 Luxembourg joint issue viewed from the angle which shows the Duke's head rather than the EU flag. 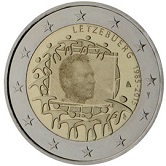 This is what all the non-Luxembourg joint commemoratives look like. 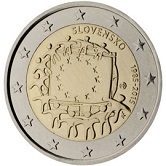 I choose the Slovenian one at random - the others will differ only in the name of the issuing country and the mint mark, if appliable. 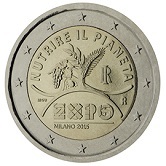 Hereunder are the country commemoratives of 2015, arranged alphabetically by country rather than chronologically. 2015 - Granting of majority to 18 year olds. 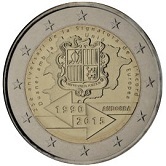 2015 - The second Andorran coin to be minted in 2015 but only issued in 2016.It commemorates the 25th anniversary of joining the EU customs union. 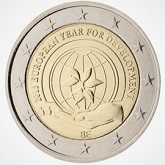 2015 - European Year of Development. 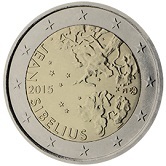 2015 - 150 th Birthday of the great Finnish composer Sibelius. 2014 - 100th Birthday of Ilmari Tapiovaara.To the left of the Inner Ring are the artists name plus birth and death dates. To the right is a furniture segment typical of the artist. 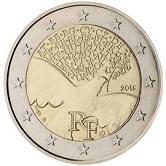 2015 - 70 Years of Peace in Europe. 2015 - 225th Anniversary of the Founding of the Republic. 2015 - Commemorating 25 years of German unity. 2015 - 75th Anniversary of the death of Spyridon Louis. 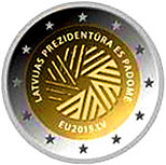 2015 - Latvia's Presidency of the Council of the EU. 2015 - 10th Anniversary of the Black Stork Protection Programme. 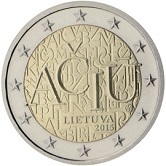 2015 - The Lithuanian Language. 2015 - 15th Anniversary of the Accession to the Throne of Grand Duke Henri. 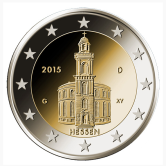 2015 - 125th Anniversary of the Dynasty Nassau-Weilburg. 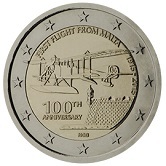 2015 - 100th Anniversary of the first Flight from Malta. 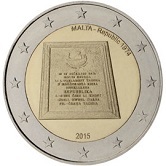 2015 - Establishment of the Republic of Malta in 1974. 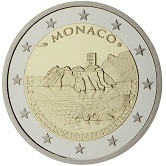 2015 - 800 years since the building of the Fortress on the rock of Monaco. 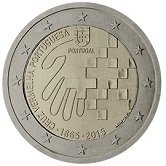 2015 - 150th Anniversary of the founding of the Portugese Red Cross. 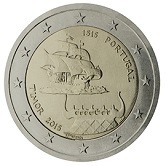 2015 - 500th Anniversary of Portugese landing in Timor. 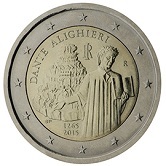 2015 - 750th anniversary of the birth of Dante Alighieri. 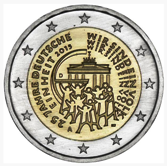 2015 - 25th anniversary of German unification. 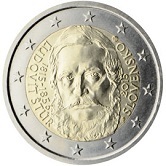 2015 - 200 Anniversary of the birthday of Ludovit Stur. 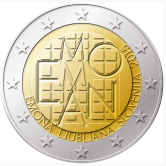 2015 - The 2000th Anniversary of the founding of Emona. Date of issue : January 2015. 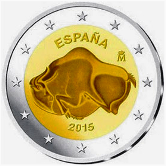 2015 - Cave of Altamira and Paleolithic Cave Art of Northern Spain. 2015 - VIII World Meeting of Families in Philadelphia. 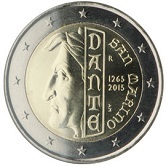 Return from Euro Coin News 2015 to euro coin collector.